I had a doozy of a day today. Starting with the coffee I forgot to drink until it was barely tepid. (In case you're wondering, cold coffee just doesn't cut it when you're running on five hours of sleep.) Moving right along to a morning knee deep in spreadsheets and other unpleasantries. Heading into the afternoon with the realization that I had forgotten my lunch and my apple at home. Lunch, for the record, is simply a protein bar. But still. One does need one's mid-day calories. And topping it off with the unfortunate realization - as I walked in the door of the house exhausted and cranky - that I had forgotten to wash the dishes this morning. But the day was miraculously cured of all doozi-ness when my darling 5-year-old princess ran off the school bus and into my arms and announced: "Mommy, you are the best Mommy ever." It's the small things. Oh, and it went uphill from there, ending with a small piece of apple pie that had miraculously survived the kids, and - yes, in that order - a plateful of roasted cauliflower. Simply prepared but wow. Really hit the spot. There really is nothing much to this recipe. Please use the best ingredients you can get your hands on: super fresh cauliflower (I'm partial to purple and yellow), fine olive oil and vinegar, and lovely salt. 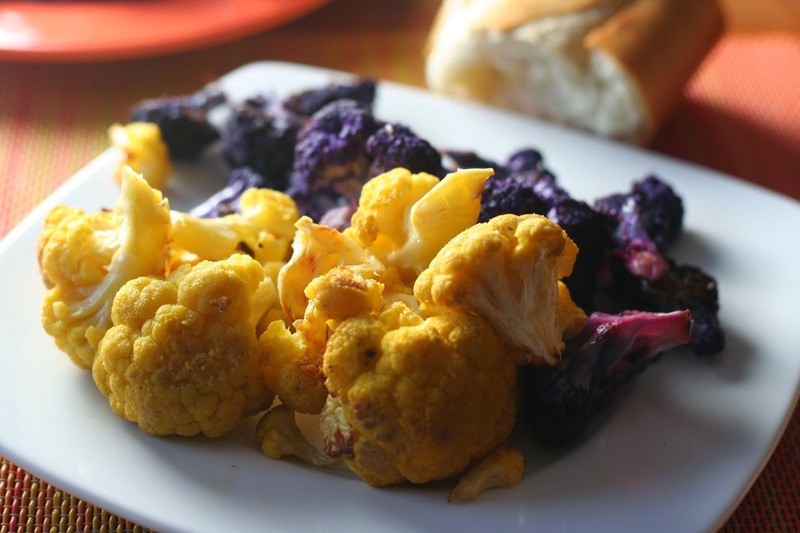 This recipe calls for one head of cauliflower, but I actually made two batches, one with each color. Preheat the oven to 425*. In a large bowl, toss together the cauliflower, 3 tablespoons of the oil, salt, pepper and garlic. Mix well (I use my hands). 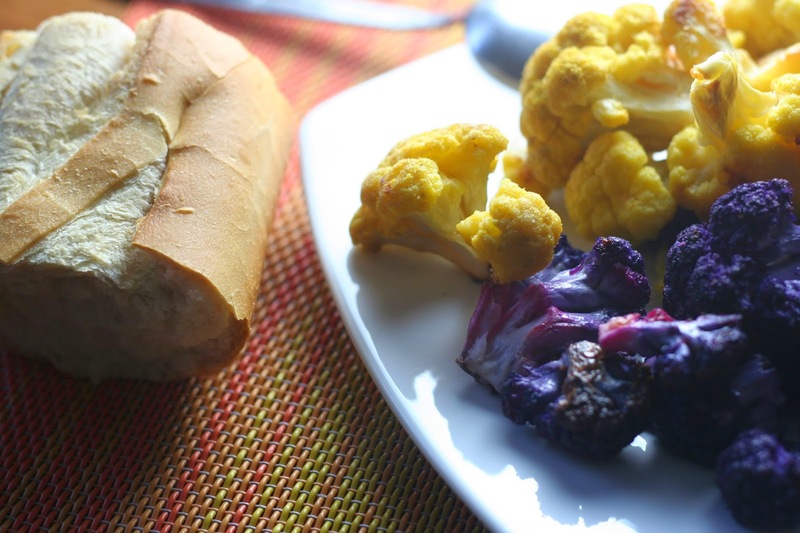 Spread the cauliflower on a large rimmed baking sheet. Bake for 20 minutes, stirring occasionally. Reduce the oven to 350* and roast for about 15 minutes more, till the cauliflower is soft and getting a bit glazed. In a small cup, whisk together the remaining tablespoon of oil and the vinegar. 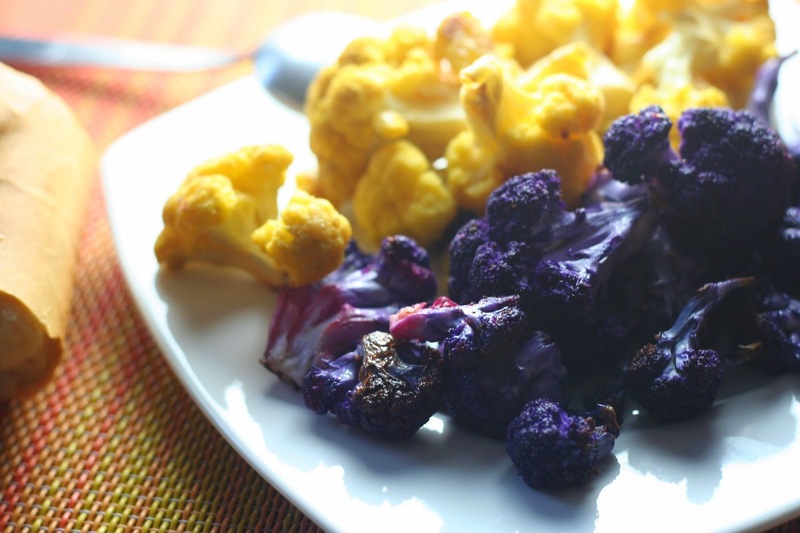 Remove the cauliflower from the oven and immediately pour on the vinaigrette. Gently toss to combine. Serve hot, warm, room temperature, or even cold. Wow! These look awesome--and they're such cool colors, too! Thanks for sharing the recipe :)! I'm so glad your day turned out okay in the end! 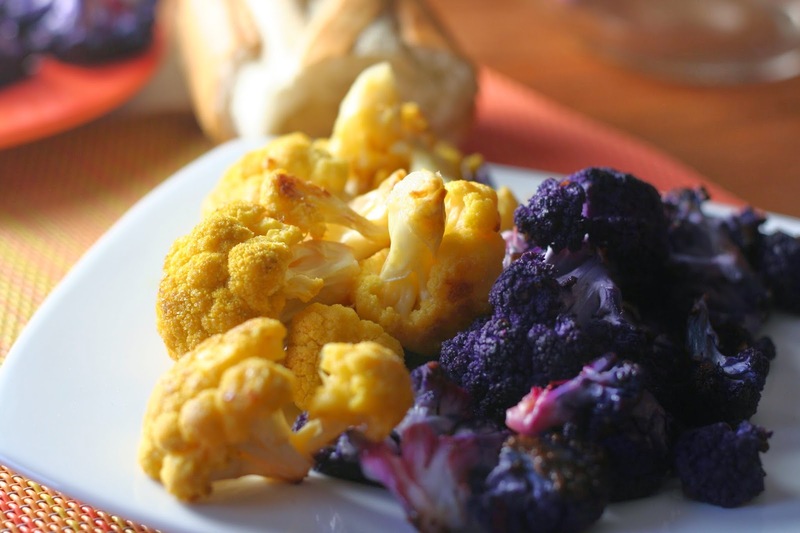 I love roasted cauliflower...I'd happily eat a whole pan for dinner!